Jack Milner: Bulleting Home missed a year of racing almost to the day. Sean Tarry’s charge ran in the Gold Challenge over 1600m on 10 June 2017 and finished a 2.75-length fifth behind Captain America. We next saw him when he contested a barrier trial over 1000m at Greyville on 9 June 2018. He finished a 1.25-length third behind Neala on that occasion and the following weekend ran in a Pinnacle Stakes over 1400m, when he ran on well to end up a 0.60-length third behind Summer Sky. Those were all preparation runs for the Grade 1 Champions Cup over 1800m on the Greyville turf but, sadly, Bulleting Home drew No 11 of the 12 runners. To make matters worse, he was not well away and ended up too far back on a day when front-running tactics worked like a charm. He turned for home in last place, 10.90 lengths off the leader, who was already Captain America, but ran on and was recorded to be the third fastest finisher. He ended up 6.65 lengths behind Captain America. On Sunday, he will race in another Pinnacle Stakes over 1400m, but this time it will be on the Greyville Polytrack. He has only raced once on this course and that was in last year’s Kings Cup (Grade 3) over 1600m. 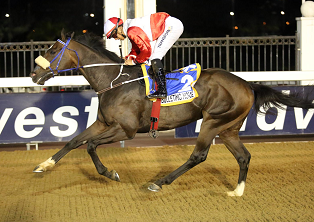 Ridden by S’manga Khumalo, the son of Western Winter ran away from his opposition to beat Royal Armour by 3.50 lengths. This time Bulleting Home has a lot in his favour. Tarry has engaged Anton Marcus to take the ride, we know he runs well on the course, he is nicely drawn at No 4 and he is the best handicapped runner. He has run against many of the best runners in country and this looks a massive drop on class for him. He looks the stand-out bet on the card and as this is the first leg of the Pick 6, punters have an excellent banker to kick off the carryover pool. The pool will start with a carryover of R213,875 and is expected to get to R1.8 million. There could be a second banker in Race 7 where Dennis Drier saddles three-year-old filly Star In The Sky. She is beautifully bred by Silvano out of a Galileo mare Dance To The Stars. The race is a Maiden Plate for fillies and mares over 1900m and this filly will enjoy the additional distance. To date she has raced in a barrier trial, followed that up with a Maiden Juvenile Plate for fillies over 1200m on the Polytrack at Greyville in which she finished a 1.75-length third behind Not Now Pussycat. She followed that up with another Maiden Plate for fillies over 1400m at Scottsville in which she again ran third, beaten 1.75 lengths by Riptide. She is bred for this sort of trip, if not even further, and with just 56kg on her back she will be hard to peg back. Drier has opted to run her in blinkers this time which hopefully, will help her even further. Sean Veale takes the ride.